The crux of the problem when confronting Jack Russell Terrier behavior is that this breed wrote the book on strong willed, stubborn as a mule, defiant as Napoleon, hard to catch little rascal you ever saw in your life. But there are some very efficient ways to master Jack Russell Terrier behavior. And also some very interesting ones. Before we go on, if you don't find the information on Jack Russell Terrier behavior you are looking for, just ask here. In Anna Katherine Nicholas' great book, Jack Russell Terriers, she tells of a man who had a dog in a kennel that would wake him up at 1:30 a.m. every night barking his head off. A platform to hold a bucket of water was constructed over the area of the kennel in which the dog usually chose to bark. Through a system of hinges, ropes, and pulleys, a mechanism was devised so that the dog owner could pull a rope from his bedroom window, dumping a bucket of water on the dog when he started to bark. The bucket was suspended such that once it was dumped, it uprighted itself and the owner could fill it again remotely by turning on a garden hose. After two appropriate dunkings, the dog's barking behavior was apparently eliminated. While this approach is inventive, it doesn't work well with those of us who are not good with pulleys, ropes and hinges. But trying to stop a dog, and especially a dog that is extremely territorial, from excessive barking, can be quite a challenge as it is a natural Jack Russell Terrier behavior response to sound an alarm when other dogs or people approach their territory. It is advisable, as good owners and good neighbors, to try and curb problem barking before it becomes a bad habit. And as I have mentioned before, START EARLY because these dogs are smart and they WILL learn, but only...if YOU are consistent. But once punishment is administered, make every attempt from that point on, to punish ALL undesirable barking. Don't allow long periods of barking to go unpunished. During this period of training it may be necessary to keep the dog inside while the owner is away, unless the dog can be, in some way, punished while the owner is gone. But don't over-punish and harm or break the dog's spirit. Remember, Jack Russell Terrier behavior is rooted in a breeding as a high-spirited hunter and diligent protector of his territorial space. One of the keys to Jack Russell Terrier behavior is praise and support. My dog Jimbo listens... most times to me. But it took us some tangling and battle of wills to get here. He loves to please me. And when the temptation over-rules his respect for me, I don't mind so much because he makes up for it in loyalty and affection that is hard to find an equal comparison. His whole life is me. If I go out, he's there at my feet. If I come in, there he is again, his eye ever watching and ready to defend. 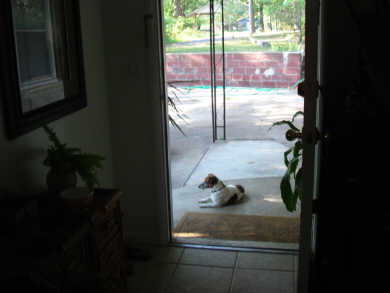 This is Jack Russell Terrier behavior at its best. Don't over stimulate your Jack: Time outs can be an effective way to handle your Jack and to help him settle down. For example, ask visitors not to interact with your dog until he or she calms down. Also, placing a harness on the dog can be a signal that calmer behavior is expected. Choose a time out corner: Select an area for your Jack to spend time when unacceptable behavior occurs. This will be a clear signal that they did soemthing wrong. If you have a puppy, lift him up and carry him to the corner. Older dogs will go when commanded. You can also send the puppy to the bed area or place inside a crate. If you decide to go the crate route, make sure it is only for your Jack to relax after being over stimulated and to calm down. Do not leave the puppy in a crate for more than 15 minutes. Jack Russells Fighting when More than one dog or pet: If two dogs are constantly fighting, it is usually due to "pack" instability. This means that it isn't clear in the household who is the dominant dog (after you). The problem often arises when an owner favors a subordinate dog, giving that dog confidence in the presence of what was the dominant dog. You should always favor the dominant dog for this reason. Jack Russell Terrier's need to know the pecking order. Once it is clear the Jack Russell Terrier behavior that you expect should return to normal. You can also let two dogs work it out. If they are hurting each other, try muzzling them and leaving them to work it out. The muzzle will keep them from hurting each other, while allowing them to establish who is more dominant. 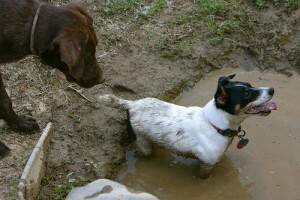 Jack Russell Terrier Digging: This is a natural behavior for Jacks. Consider funneling this behavior into a specific area of the yard. Use a command such as "OK dig" so your Jack knows when it is an acceptable behavior. Frustration is often the cause of digging, such as being placed outside when company arrives as a "punishment." By using behavior modification you can address the issue with visitors, and then the digging should stop. Jack Russell Terrier Chewing: Chewing is a natural canine behavior. Jacks have strong jaws, so chewing can be an issue. The simple quick way to encourage Jack Russell stop chewing behavior is to remove items from reach that your puppy chews, and replace them with durable chew toys. Consider something like the Kong toys that had treats in the chew toy. This will exercise your Jacks mind and keep the chewing to those few favorite toys. One technique for puppies is to take the item that you don't want chewed out of their mouth while saying "no chew" or some other command. Then immediately replace it with another acceptable chew toy and say "good chew" or something like that. Jack Russell Barking: The key to barking is to determine the underlying cause and then by applying the appropriate training method. For example, does barking occur after a visitor arrives, due to boredom, separation anxiety, excitement etc. In general, dogs bark when there is some perceived pleasure associated with the action, such as when wanting to play a came of fetch. Sometimes simply ignoring the situation can help, as this creates a negative reward for the behavior (this method can take weeks). If your Jack barks due to territorial concern, sometimes just acknowledging the barking, will get the Jack to stop. The Jack may just wanting you to acknowledge that it has protected your territory. Use a command if you dog stops and praise the dog for doing so. Jacks that bark out of fear or that are insecure is a different issue. For example, if guests move away when your dog barks, that is reinforcing their behavior, since they now know that they can get people to move away or that they can be intimidating. This is often the case for the mail man or delivery people that leave after dropping something off. Unfortunately, dog barking is a fact of life. Sometimes how the puppy is treated, or even praised for barking when young, may send the wrong signal The best approach is either to purchase an on line training course such as the one offered by Dove Creswell or seek out a local professional trainer. If you don't see the Jack Russell behavior information you are looking for or have any suggestions please fill out the form below. Have a Jack Russeel Behavior Question or Suggestion? 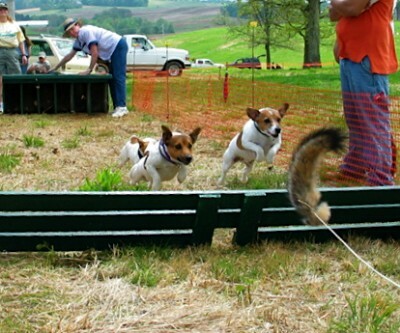 Share your questions and tips about any Jack Russell behavior challenges or suggestions. Proper training and behavior modification is key to having a happy and successful relationship with your Jack. I will try to answer any questions as best I can. And of course we have thousands of readers who are always happy to help. Or if you have an answer to any of the questions, it would be such a help to all seeking information about their beloved Jack Russells.